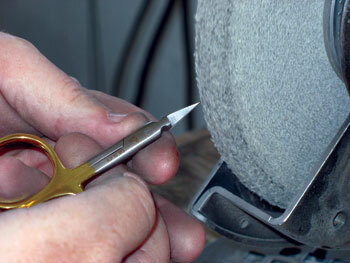 Putting the final touches on the edges of scissors at Dr. Slick Company. Even though fly fishers frequently use high quality instruments, we rarely think of what goes into the making of those items. They are instruments that normally travel a long road that includes design, materials selection, prototyping, calibrating and testing, retesting and tweaking, manufacturing—all the way through to a final polish and QC. The end result is a product that’s functional, feels balanced in the hand, is durable and (more often than not) a sight to behold. They are the items that we return to regularly because they are pleasure to use, and it’s that sense of pleasure that describes how and why quality goods overshadow inferior ones. 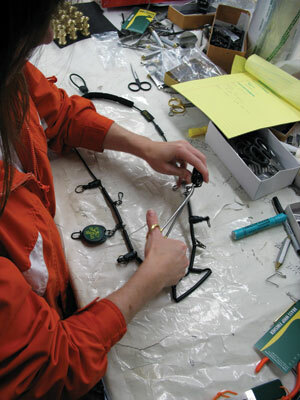 Dr. Slick is regarded as a top-tier supplier of fly tying gear and on-the-water accessories. I don’t tie, but do use their extra-long jawed Barracuda pliers—which I consider a no-brainer when fishing in salt water, or for pike and musky. The design, build and finish bear all the Dr. Slick hallmarks. These pliers are going to attend to many, many fish. The company, guided by owner Steve Fournier, is obsessive about not only providing some of the best and widest variety of tying gear available, but incessantly raising the bar with regards to quality and functionality. I recently caught up with Mr. Fournier and asked him a few questions about himself and his company. RM: A bit of background info, please. Steve Fournier: I joined DR.SLICK Company in 1997 after four years with Thomas & Thomas Fly Rod Co. and a few stops at some retail fly shops. I have been involved in the fly fishing industry in manufacturing, sales, retail and distribution since 1988. I was hired at DR.SLICK as general manager/head of sales and chief widget maker. DR.SLICK Co. was founded in 1989 by Dr. Ken High (urologist). The company was originally based in Dillon Montana but moved to our present facility in Belgrade, Montana in 2000. Dr. High sold the company to me and another employee in 2009. The name DR.SLICK comes from Dr. High’s proclivity for soaking his fly lines in silicon before steelhead fishing. It made for some legendary casts! RM: What motivated Dr. High to start the company? SF: Dr. High was unhappy with the quality of the fly tying and streamside instruments he was using in fly fishing and fly tying. Being a surgeon, he was used to high quality, well-designed tools for specific tasks in the surgical suites, but there was nothing like this for fly tying and angling. Our first efforts were to basically take existing medical tools and modify them for the needed tasks (scissors for fly tying and clamps for streamside use). This met with reasonable success, but it became clear after much trial and error that most of the items would need to be designed from the ground up for the needs of the tier and angler. Since those initial efforts, each item is designed from scratch. We can control the die/molds, metal used, type of jaw structure, hardness, finish etc. Testing scissors on actual tying materials. Most of the items are manufactured overseas and then they arrive at our shop as whole units or pieces. We can handle each item up to six times from arrival to departure. All units are tested to ensure they meet our requirements for the task. 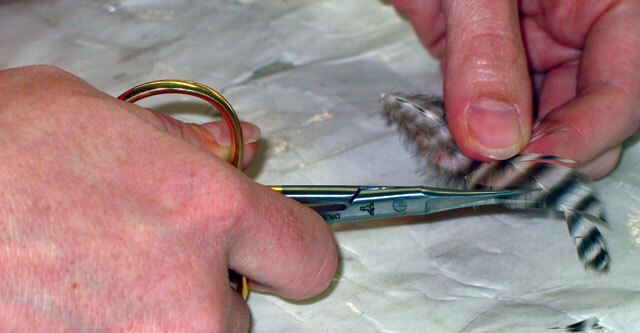 Each scissor has the blades and tips examined and cut tested to ensure sharpness. 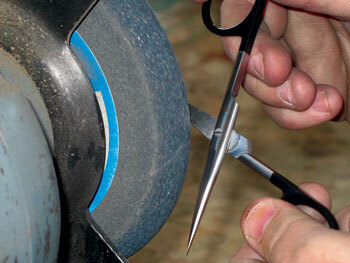 If there are problems, we can sharpen the blades and/or refine the tips to get them even and sharp. Each clamp is opened and closed and put under a stress test to ensure smooth operation, if problems exist with the ratchets being too hard or loose, we fix that by hand, or with hammers. Each bobbin is threaded and tested. The list of what we do goes on and on, but the point is tyers and anglers have come to expect this level of effort from us to achieve the final product. In the end we are dedicated to the highest quality and the most consistent product we can deliver. It’s one of the reasons we put of products in poly bags for display. We want you to handle and feel the item. The company currently operates with five employees, and market growth has averaged double digits over the past 14 years. SF: I wear many hats at DR.SLICK and have done so since 2000. I design all products, run the sales and marketing departments, oversee all the reps, fill a few orders daily, and work on 400 scissors and face/polish 500-600 line clippers per week. A short day is 11 hours, and I enjoy every minute of it. I would much rather be testing clamps or making bobbins versus sitting at a desk. Like any good company, I am fortunate to have great people around me. RM: Your biggest day-to-day challenges? Sourcing materials? Implementing/revising production techniques? Design challenges? QC? Other challenges? SF: Our biggest day-to-day challenge is maintaining the expected level of quality on the finished product (QC). Most of our items are hand-finished. We don’t have the luxury of CNC or machined processes. We must constantly change our inspection and correction processes on items to adapt to the small inconsistencies/variances. That said, we have seen just about everything, so we adopt the corrective measures and move on. After 15 years, we have lots of different techniques to mollify most issues on any item. Other issues that can cause headaches are sourcing raw stainless steel and brass. Supply-line distances and global politics & policies is always fun! RM: Which items do you consider your most innovative pieces to date? SF: I’d like to start with a word about how we come up with our products. We pride ourselves on innovating and creating new products that fill a need in the tying and angling world. I fish and tie a lot so I see lots of needs based on my experiences. I’ll take that knowledge and work on improving one of our existing tools or invent a new item from scratch to fill the need. I also keep a note book of every comment/complaint I receive and use that to improve existing items or help with the development of a new item. I call it the “you should “ and “have you thought about” depository. If I see lots of similar comments, then I’ll research those further to determine their marketability. Over the past 15 years I’ve designed close to 40 items and I’m always working on the next thing. Right now we have 15 items in the R&D pipeline. There are also constant improvements to existing products. We have a few patents for our efforts. Scissors: Razors, Tungsten Carbide, Bent Shaft, Micro-Tip, Twisted Loop and advanced 30 degree curved blades on our curved models of scissors. Fly Tying: Spigot Bobbin, Jumbo Handle Tying tools, Hair Stackers, Extra Hand and Bead Tweezers. Clamps: Release Clamps, Shot Clamps, Twisted Loop, Hook eye cleaning pin in shank design and 30-degree curved jaws on curved clamp models. Line Clippers: Off Set clipper and the Knot Tying Clipper. RM: You have a dedicated following among those in the tying community. What are the reasons for this? SF: I attribute that to our dedication to quality, consistency and innovation. Tiers like to know that when their favorite scissors wear out after 10 years, the replacement will be just like their retired favorite. Same for the angler: when a clamp is lost or retired, they want the same item that they had and have it perform the same way. RM: Your general views on the fly fishing industry: optimistic/pessimistic? Do you see any trends unfolding? 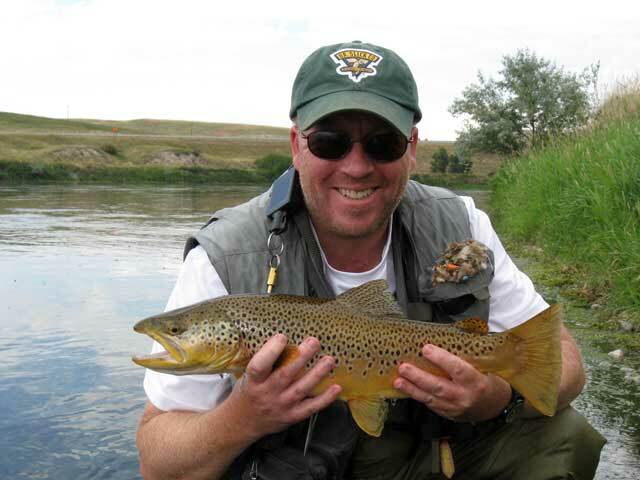 SF: I enjoy the fly fishing industry. I think the industry size makes it easy to stay connected with the customers and shops. It is not a big fraternity, so we all kind of know each other. I’m optimistic that the innovation in the industry will carry the day and keep the sport fresh and exciting for new and existing participants. I’m not much of a pessimist, but I have been in this industry for a long time and I’m not a huge fan of the consolidation of the industry. I think that can cause a stifling effect on innovation and thus the industry. As for trends, I’m excited to see more fly tying happening. It looked like that might be a dying art form a few years back, but new materials and a whole batch of really good young tiers has turned that around. I think on the angling side, saltwater fishing is definitely on the upswing, as well as pursuit of nontraditional species like carp. RM: Do you have time to tie flies? And do you consider yourself a good fly tier? SF: I tie a lot of flies, but not as many as I used to. It’s probably around 30 or 40 dozen a year. I consider myself a solid tier and can tie trout, salmon, steelhead and a few saltwater patterns pretty well. I spend more time on the bench working with new synthetic and natural materials and figuring out their pluses and minuses while knocking out a dozen flies. I need to stay abreast of new materials and make sure our scissors and tying tools can keep up with the advancement of those materials (I get a few boxes of materials to test each month). In the 70s, when I began tying, most of the materials used to construct a fly were naturals, but today synthetic materials rule the vise. I’ve had to modify scissors or come out with whole new lines to handle the synthetic materials, which can be hell on standard scissor blades. Items like the Razor scissors, T.C scissors, Scissor of Mass Destruction and the obviously named Synthetic Scissor are all designed to handle modern materials—plus the naturals. RM: How many days have you fished in the last 12 months? SF: I currently fish around 100 days per year. Before I got married and had kids, the number of days fishing was rather insane. RM: Your most recent fishing destination? SF: Upper Madison for some hopper action and couple of no-name creeks. I’m a big fan of the Missouri River around Craig. You will find me up there often. RM: Your favorite fishing destination? SF: Tough question, as there are so many. Atlantic salmon on the Margaree in Nova Scotia. Blue fish in Long Island Sound. Steelhead on the Deschutes. Missouri River anytime the blue wings are popping. RM: Favorite species to target? SF: Big trout and really big Atlantic salmon. I’m also hoping to do more saltwater angling over the next 12 months.